By definition, anger is an emotion felt towards something or someone that has negatively affected a person. In young children, anger might be caused by simple things such as a toy being pulled away by a playmate, or another child seating on a chair which he/she was supposed to occupy. Anger can be triggered by people, things, or situation that they feel has deliberately done them something wrong. On the other hand, frustration is an emotion felt as a result of being unable to do or achieve something. This is a common thing among toddlers since at their age, they are still practicing their skills of trying to do things on their own. For example, being unable to write a circle, or finding it hard to get a toy from a box can frustrate them. Observe your little one. What seems to trigger his/her anger or frustration? Is it a toy, playmate, or a stranger perhaps? Knowing what causes him/her to behave negatively would already give you a hint of things you want your child to avoid in order to keep his/her mood calm and stable. As the old saying goes, prevention is better than cure. Parents need to respond to the situation as soon as possible. For instance, if your toddler suddenly hits his playmate with a toy, you can respond promptly by holding his/her hand firmly (not to the extent that it hurts). This simple act would mean that hitting was not an acceptable way to express his/her emotions. 3. Recognize his/her emotion first. In helping our little toddler cope better with anger and frustration, parents need to take note that they should recognize the emotions of their little one first (“I know you’re angry”, or “I understand you’re upset”) before setting limits. An example would be, “I know you’re really mad about the seat which was supposed to be yours (recognizing the anger), but you can’t just push somebody away from it. Using this strategy will help parents communicate with their child that they understand his/her feelings, but they need to set a limit to an unacceptable behavior. If your toddler has managed to keep his/her emotions to acceptable limits, giving a positive reinforcement would make it more likely for him/her to do it again. Words like, “I am proud that you have remained calm”, or “I am glad that you didn’t hurt your playmate this time”, would give your toddler a sense of approval and compliment to act more responsibly. Observe yourself – how do you usually respond to stressful situations? Are you the type of person who could remain calm or are you one who acts aggressively as well? Toddlers are great imitators. If we want to teach them something, it can be easily done by starting out with our own selves. Learning will always start from home. 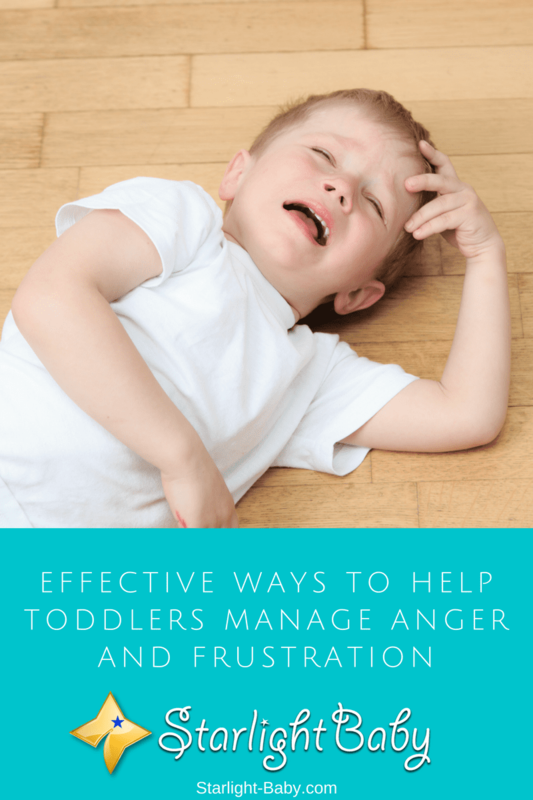 Teaching a toddler how to manage his/her anger or frustration can be very challenging but is essential as it can reinforce positive coping strategies which they can use later in life. My baby is just 8 months old, however, he is already showing anger. When he does not get what he wants, he begins to make noise or cry loudly. Since he does not understand words yet, it is quite difficult to soothe him, therefore, whenever he desires something, a phone, laptop, a spoon, bottles, we give it to me and make sure he does not harm himself. We know this might raise him into an intolerable boy, but there is nothing we can do at this moment. Experts say babies start to understand what the word “No” means at around 6 months of age. However, they would have a better understanding of it around 12 months onward. You may want to give him an alternative toy to distract his attention from phones, laptop, etc. I have a 4 year old son and he usually shows anger and frustration with toys. Especially with toys with broken parts and don’t functional well but still wants to play with. I try to help him by showing him how to fix some toys that are still fixable, but for those that are really broken, like battery issues, that’s when he shows frustration. I try my best to explain to him that there’s nothing I can do, but if it doesn’t work, I give him other toys that he often play with as well and tell him that it’s better to play with it than the broken one. Yes, you’re on the right track – you are recognizing the triggers and distracting him from the things that fuel his anger and frustration by giving him alternative toys. Keep it up! The thing with anger management of the little ones boil down to managing their emotions. When they feel you have the connection with them and ready to help keep them calm, they will respond. Understanding what makes the little one angry is a good way to ensure it doesn’t repeat itself in the future which is good. You’re right. Knowing what a child feels and being able to respond to it is the key to preventing a full-blown tantrum. If we know what triggers his/her anger and frustration, then we can prevent it and the child will be happy when we do. Sure, even the adults need some care from those around them talk more of the little ones that would need the attention of the parent almost more than 12 hours of the day. Ensuring we, as parents, show that emotional empathy towards them, it’s going to make things work right at the end of the day. The thing I can tell you about anger management is that if it’s not checked when it’s growing with frustration, it’s bound to make the child a violent and dangerous individual growing up. Such kids with chronic anger issues are always very abusive both in words and actions, which is why such child is to be cared extensively by their parents to help he feel love. There no drug more powerful for reverting anger issues as love, it has the tendency of melting such anger and frustration into oblivion. Yes, I would say that is true. Some kids do have bad tempers and it’s important to curb it at the earliest possible time. If not, they could become bullies who inflict physical pain on others and become abusive adults. It’s important to make them understand the possible consequences of their anger by explaining it in a loving way. And of course, showing them how much you love them is also a key. This all falls on the parents being very observant and not sparing the rod too much when it comes to disciplining the child when he or she does something wrong. Be an enforcer of values and see your child grow up being good.